SHE is at the pinnacle which most dream to reach but only a few human beings, especially women, are able to achieve. The first woman Air Marshal, the second-highest rank in the Indian Air Force, Air Marshal Padmavathy Bandhopadyay has achieved which no other woman in India has been able to do in its long and rich history of Armed Forces. Vimla Patil writes about the experience of Jayashree, possibly the first Marwari woman to trek to Kala Patthar. Women who get entangled in the web of home, children and housekeeping should taste the marvels of the world and take a leaf out of her experience. Jayashree Jain recently trekked to Kala Patthar in Himalayas, near the base camp from where the world’s most famous mountaineers begin their climb to the everest. "Crossing the age of 50 makes one look back and wonder what one has accomplished in life," says Jayashree, an interior designer working between Mumbai and Kolkata, "I needed to meditate upon what I really wanted to do before I became a senior citizen and it struck me that more than anything, I wanted to experience life in crazy, mad ways before it was too late. Shobha Gurtu, who passed away some time back has bequeathed the world of Hindustani classical music with a glorious legacy. Rich with lilting strains, her music presents itself as an incredible blend of styles that define the endearing thumri – a form that rose to repute from the court of Wajid Ali Shah of Lucknow in the mid-nineteenth century. SHE is at the pinnacle which most dream to reach but only a few human beings, especially women, are able to achieve. The first woman Air Marshal, the second-highest rank in the Indian Air Force (IAF), Air Marshal Padmavathy Bandhopadyay has achieved which no other woman in India has been able to do in its long and rich history of Armed Forces. She says that had it not been for the unstinted support given by her husband, a former IAF officer, and her two children, she would not have achieved what she has. Although her husband Wing Commander (Dr) S.N. Bandhopadyay retired from service many years ago, he continued to support her. Similarly, her sons have been extremely cooperative. Even as children, they were never demanding and always excelled in their studies. Sometimes she felt rather guilty because of her constant postings. On their part, the children adjusted well to the nomadic life and developed self-confidence, which helped them build their futures. She wanted at least one of them to be in the Armed Forces but that was not to be. Her message to the women of India is "In India, a woman can aspire for any post, depending on her aptitude and capabilities. One should remember to go ahead despite the social pulls and pushes." After retirement, she wants to involve herself in `social organisations’ in order to help the poor and destitute to give back something to the society which gave her honour and glory in abundance. Born at Tirupati on November 4, 1944, Bandhopadyay is the daughter of a Government servant who had the privilege of working under Pandit Jawaharlal Nehru, John Mathai and C.D. Deshmukh. She passed her Higher Secondary from Delhi in Arts but her thirst for scientific knowledge spurred her on to switch over to the science stream. She was selected for the prestigious Armed Forces Medical College where she bagged the Chief of Air Staff’s Silver Medal for topping in Physiology, Chief of the Army Staff’s Bronze Medal for academic excellence in Anatomy, Chief of the Naval Staff’s Silver Medal for topping in Pathology and the Gold Medal for topping in Medicine. After graduation, she was Commissioned as Flying Officer in the Indian Air Force on January 22, 1968. She married then Flying Officer S.N. Bandopadhyay on February 13, 1969, at Bangalore with the blessing of parents, relatives, the then Air Chief -designate, Air Marshal P.C. Lal. A Ph.D in management from IIT-Delhi, S.N. Bandopadhyaya, is now a renowned management consultant to a large number of companies and institutes at the national and international level. One of their sons — Amiya, (MBBS from AIIMS, Delhi and MD from NIMILANS, Bangalore) is a consultant psychiatrist in Delhi, and Ajit, (BE Computers from IIT, Kanpur and MS form (Pennsylvania State University) is a computer engineer settled in Seattle, USA. Throughout her service career, she had upheld `service before self’ as her motto. Perhaps unprecedented in the medical history of India in the early 70s was the untiring effort with which she undertook the responsibility of taking up the cases of three premature babies weighing 0.75 kg 1 kg and 1.20 kg respectively. She, using her practical knowledge ensured they live with the help of an incubator she improvised herself. During the 1971 operations, she voluntarily accepted the hazardous tasks of Admin Control Centre, Operational areas, in addition to the hospital duties, at the cost of personal safety. Her practical skill was a great help to the field surgical team for conducting various intricate surgical operations on war casualties. She was awarded Vishisht Seva Medal by the President of India on Jan uary 26, 1972, along with her husband, the then Flt Lt S.N. Bandopathyay, in the same investiture parade for her devotion to duty. They are the only couple in Indian Armed Forces history to get decorated on the same day. 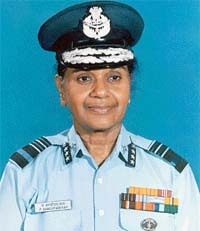 Bandhopadyay was the first lady to become an Air Commodore and also the first lady to command AFCME. She completed the Postgraduate diploma in Aviation Medicine from Bangalore University in April, 1975. In April,1984, she passed `Doctor of Medicine in Physiology’. She has contributed significantly in the field of ameliorating the effects of noise in air bases, designing and development of flying clothing and in fields of hypoxia and space physiology. As a researcher in Aviation Medicine, she has had the privilege of flying aircrafts like the Gnat, Hunter, MIG-21 and MIH-25. She undertook research in high altitude and contributed in the formulation of acclimatisation schedule for Armed Forces personnel posted at high altitude. She has worked on the patho-genesis of High Altitude Pulmonary Oedema (HAPO). She has travelled extensively and camped at high altitudes in the Western and Eastern Sectors to complete research. 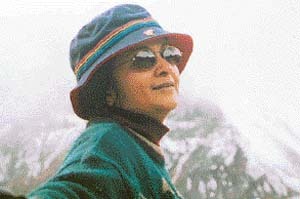 The first Indian woman to have been to the North Polar circle, is an experience Bandhopadyay cherishes. "It was extraordinary" she says of that 10-week trip which was conducted to evaluate the carious physiological and psychological problems associated with extreme cold. The normal temperature in the Arctic is -350 C but when the wind blows, it can drop to -550C. She is the first lady Aerospace Medicine Specialist in India since 1975, first lady officer to have successfully completed Defence Services Staff College at Wellington in 1978: and the first lady officer of the Indian Armed Forces to be awarded the prestigious Indira Gandhi Priyadarshani Award in 1995 for outstanding services. She is the first lady fellow of the Aerospace Medical Society of India and the first woman officer to be awarded the Ati Vishisht Seva Medal (AVSM), on Republic Day in 2002. Jayashree Jain recently trekked to Kala Patthar in Himalayas, near the base camp from where the world’s most famous mountaineers begin their climb to the everest. "Crossing the age of 50 makes one look back and wonder what one has accomplished in life," says Jayashree, an interior designer working between Mumbai and Kolkata, "I needed to meditate upon what I really wanted to do before I became a senior citizen and it struck me that more than anything, I wanted to experience life in crazy, mad ways before it was too late. I wanted to appreciate different cultures, different landscapes and meet people who lived a completely different lifestyle to mine. Thus, I got together a small group of people who decided to make the trek into the Himalayas to reach the base camp before the climb to the Everest begins." In late April 2004, Jayashree, her husband and a few friends started their trek from Nepal and crossing the Khumbu valley reached Namche Bazaar, the last town of the Sherpas before the Himalayan trek begins after Lukla. Says Jayashree, "I think treks into mountains literally take you into the heights of solitude and self-analysis. Every moment is a new opportunity to meditate upon the vast silence of life and to learn essential truths, which never dawn upon you in the din of city life and its inevitable stress. The melting snows, the green woods at the foothills and the slow and steady barrenness of the mountains as you climb higher are a pattern of life. Youth is lush, with its desires and lusts. As age advances, starkness of life strikes one like a thunderbolt. In the Himalayas, one is always in the presence of water, the nectar of life, which makes such landscapes entirely bearable. With every step, one appreciates solitude more and more. "I learnt during this arduous trek that trekking in the high mountains is not easy. One has to maintain a high level of fitness and develop strength of will. There are many occasions when one wishes to give up. Every step up the slopes over the rough paths seems like a trial. But clear resolve gives one the power to complete the mission. I learnt in this experience that to reach the destination one chooses in life, one often has to walk alone, at one’s own pace. One has to accept the minimum amenities of living such as tent living, frugal food and extreme cold, which taught me endurance of the highest kind. "Once the road ended in narrow foot treks, we followed the milky Doodhsol river and from thereon, there was dearth of water. The Sherpas who accompanied us — as they do every group — were so used to the climate, that they could carry our baggage, pitch tents, boil river water for drinking and cook simple meals for us wherever we camped. "At long last, when we reached Kala Patthar — which is near the base camp from where the world’s most well-known mountaineers begin their climb to the Everest — we could view Mount Everest — also called Sagar Matha—from close. Peeping from between two high, snowy peaks, it presented to me the most exhilarating moment of my life. "During the 12-day trek, we passed many villages and rural settlements, Namche Bazaar being the biggest town. But once we were on the trek, camping after 8 to 12 hours of walking, we had no contact with the world. There were no phones, no TV or any newspapers. Only, if a trekker got really seriously sick, could we call for a helicopter to take him or her back." Jayashree is an interior designer and jewellery designer by profession. But increasingly, she has lessened her work to trek in the mountains, travel around the world and spend time in the villages of India to enrich her life. "My son is now settled and can take his own decisions and my husband and I are relatively free to do whatever gives us pleasure," she says. Jayashree believes that once one has enough to live comfortably, the pursuit of more and more money is futile. "It does not take us anywhere because a rich life is better than a moneyed life. I feel now that if I have enough to have a clean bed, a good toilet and ordinary food, I am happy. Seeing the world, meeting all kinds of people and learning about their culture is an infinitely more interesting option. I am determined to do this as long as I can. I don’t mind living in a village to learn about the life of rural people and share their culture, their problems and their joys. Their hardy life is sometimes more rewarding than the tinselly life we lead in the cities. The stress of urban life becomes unbearable and the relief such adventure trips give is incredible." True to the thumri tradition, Gurtu’s rendition recognised no confines. Her technique was meant to enhance freedom, not to trammel the evocative verse with reason, often attributed to rigidly tutored musicians. She respected tradition, but like her idol, Begum Akhtar, moved beyond disciplines to court all that is liberal in the realm of music. No wonder her admirers love her uninhibited presentations. Her death may have extinguished the possibility of soaking in her "live" music, but it can hardly take away the eternal charm with which she endowed each piece she accepted for translation on the space of performance. Even during the later part of her life, she never quite abandoned the concert circuit despite her ill health. Accompanied by her sons, she graced significant symposiums, rivetting listeners with her style that mirrored the rustic allure of Begum Akhtar, the perfect timing of Rasoolan Bai and the seductive charm of Siddheshwari Devi. Gurtu was highly influenced by the Banaras Gharana’s Purab Ang Gayaki which gave thumri its envious reputation. Rasoolan Bai, Siddheshwari Devi and Girija Devi have been the most celebrated torchbearers of this style. It was the musical interpretation of Ustad Bade Ghulam Ali Khan which captured Shobha Gurtu’s imagination. Knows for his khayal renditions, Ustad Bade Ghulam Ali Khan enriched thumri with his spotless Punjab Ang (Patiala) Gayaki. A student of classical khayal under Ustad Nathan Khan, Gurtu also chose to gratify her passion for light classical musical forms like thumri and dadra. It was her zeal for mastering the unordinary that inspired Ustad Ghamman Khan to take her under his wings. 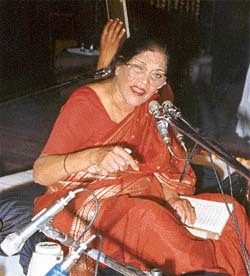 As an inheritor of his golden repertory, she emerged as the undisputed queen of thumri, soon after the throne fell vacant after Begum Akhtar’s demise. Interestingly, Shobha never faced the dearth of motivation. Her mother Menokabai Shirodkar was a celebrated classical dancer and a disciple of Ustad Alladiya Khan, the founder of Jaipur tradition. Her mother taught her art appreciation. The journey that began from home led Gurtu to the world stage. She exhibited admirable ease at nearly all thumri varieties – Kajri which is an ode to monsoon; Hori which is sung during the festival of colours; and other harvest melodies like Chaiti, Sawan and Jhoola. A proud recipient of the Padma Bhushan, the Sangeet Natak Akademi Award, and the Shahu Maharaj Puraskar, Shobha Gurtu was best identified with a full-throated rendition that brought forth the true seductive charm of thumri. When she struck light classical melodies, she was "Shingaar" personified. Gurtu’s presentation of Kabir’s daughter Kamali’s compositions proved her mastery in the Sufi tradition. Her music tugged at the heart strings on two fronts – ethereal and philosophical when she preferred Kabir and other saints; vivacious and romantic when she was the Radha beckoning Krishna with her weaponry of Shingara rasa. Gurtu also collaborated extensively with musicians from other streams. She worked with legends like Ustad Sultan Khan (sarangi), Ustad Nizamuddin Khan (tabla) and Purushottam Walawalkar (harmonium). Mercifully for those of us who could not hear her live, the vocalist has left behind a huge corpus of recordings. Her musical greatness has been captured on vinyl, tape, and CD for progenies.